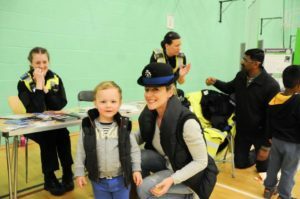 We had a number of stalls offering various ser vices including finding out more about LOROS, speaking to the local Police, a yummy cake sale, learning about CPR at Joe Humphries Memorial Trust stand and plenty more. There were also lots of activities for everyone and lots of people took part in basketball, table tennis and laughter yoga. The laughter yoga was really popular and everyone that took part left feeling happy and incredibly smiley! The team from Joe Humphries Memorial Trust were running a CPR and Defibrillator awareness session which was very popular and a lot of children and adults took part in learning how they could help to save lives. Have a read of the JHMT post on the event. The Silver Star bus included a screening test for diabetes , 35 people were tested for free and loads more were given free advice about their health and diabetes from the Get Healthy team and the DMU Square Mile Diabetes team who were also at our event. Vanessa from Tickled Skink provided the opportunity for children and parents to meet and get their hands on snakes and frogs – there were definitely more children than adults holding Frieda the frog and the other animals! 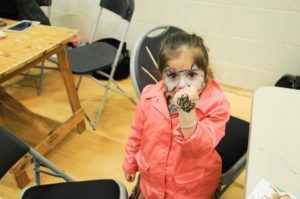 The face painting and mehendi stands were also very popular and in a couple of hours, there were loads of kids with Batman, Spiderman, fairies and butterflies all over the place. Spark academy showed all the kids that “learning can be fun” and got all their questions answered. The healthy food tuckshop and cake stall were always busy and by the end of the day, everything was gone – a great sign showing the food was great! Overall, the day was a huge success and we’ve had a lot of interest about stalls next year, so we’ll be looking into what we can do and when – watch this space! In the meantime, keep an eye out for more info on event 2 and how you can take part in the rest of the events! This entry was posted in 7events, Campaign one, Community, Fundraising and tagged Community, Family, Health, Wellbeing. Bookmark the permalink. 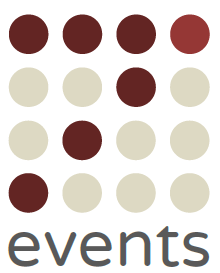 ← Who and what is 7events?